Barrday Inc., a major player in the composite market, and Arkema, the French chemical group, announced the creation of a joint venture to manufacture and market carbon fiber and specialty polymer tapes for the growing oil and gas industrial market. The new venture, to be named Barrflex® TU, will supply thermoplastic composite solutions to the various players of the oil and gas industrial markets. 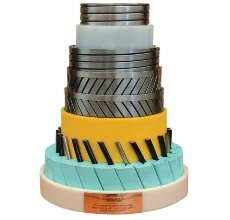 The companies say that Barrflex TU´s tapes will deliver substantial improvements in terms of weight reduction (replacement of metal) and corrosion resistance for the flexible pipes used in the deep offshore as well as onshore operations of tomorrow. Barrflex®TU will be focused on meeting customer composite tape requirements using any resin, fiber and the development of product and process technology. "This partnership with Arkema provides us with access to a unique and wide range of proven polymer solutions for this sector. For a long time Arkema has been an innovative and renowned player in fluoropolymers with Kynar® PVDF, in specialty polymers with Rilsan® PA11, and more recently with its new Kepstan® PEKK resins. We are delighted to be teaming with Arkema for this exciting oil and gas opportunity", said Michael Buckstein, Chief Executive Officer of Barrday Inc.